French Minister talks about Mandriva! / La ministre Kosciusko-Morizet cite Mandriva ! Those exceptional images were taken on April 13th, by Thierry Legault, an astrophotograph. Ces images exceptionnelles ont été prises le 13 avril par Thierry Legault, un astrophotograph. Open Virtual Desktop v1.0 out w/support for both Win and Linux apps! Gravity trains: the greenest transportation! Le moyen de transport le plus écologique : les trains à gravitation ! Read about Gravity trains, it’s awesome. Recently I got interested in traffic shaping to simulate various bandwidth capacities. It was a headache to find a working software in that field until I realized that 1) it was easy 2) it was straighforward on Linux kernel since version (2.2.x?). Then all you have to do is to use the “tc” utility which is part of the iproute package. You will notice easily that it’s doing the job very well. Anyway, I went into some troubles when I started to monitor the traffic: the bandwidth that I set with tc doesn’t fit at all with the actual limitation. For instance, when setting 50kbit in tc, I get a real limitation of around 24 *kBytes* per second, which is about 200kbps. At first, I thought it was a problem with “knetdockapp” that I’m using to monitor the traffic. So I used Bandwidthd which shew similar results, and finally, I transferred a big file during 60 seconds and calculated the real rate from the number of bytes that were received. The results were still the same. So I’m still wondering why there is such a difference between the figure provided to tc and the real shaped bandwidth. Following its commitment to desktop virtualization solutions, Ulteo, an Open Virtual Desktop Infrastructure company, announced today that they were releasing the first version of their Open Virtual Desktop solution for enterprises. Delivering faster deployment times and ease of management for the IT department, this first release can be integrated easily into an existing professional Linux or Windows IT environment. The solution can be up and running in a few minutes, delivering rich desktop applications to corporate users. 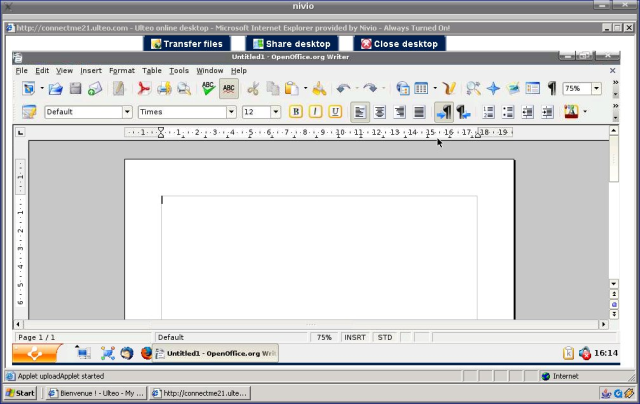 How to get OpenOffice in Nivio? I was recently trying Nivio, the Online Desktop project that raised about 18 M€ to fuel its development, and I noticed there was no wordprocessor available. But I found a solution: open Internet Explorer and launch Ulteo Online Desktop. You’re done! It’s slick, automatic, and have the latest software version inside (Firefox 3, OpenOffice 2.4…). We’re on track to release the first alpha of Ulteo “Polaris”, and guess what? Soon you may be able to play with the first Ulteo SBC/VDI solution for corporates.